ARTISTS: 副島 ショーゴ, Fumihiko Chiba, SAKURAI MAKOTO (Dragon Ash), TJO (Takeru John Otoguro), YASUKI, Astro_Hun, KEI YAMAMOTO, DJ MASAMI, TaiGa, DEJAMAIS, VJ shinjiranger, Jericho. 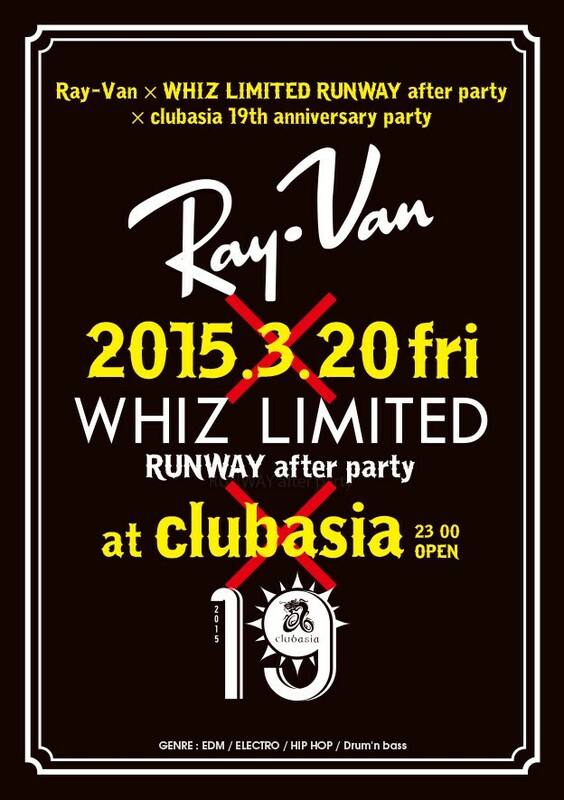 Mercedes-Benz FashionWeek TOKYO RUNWAY after partyとのコラボ開催!! 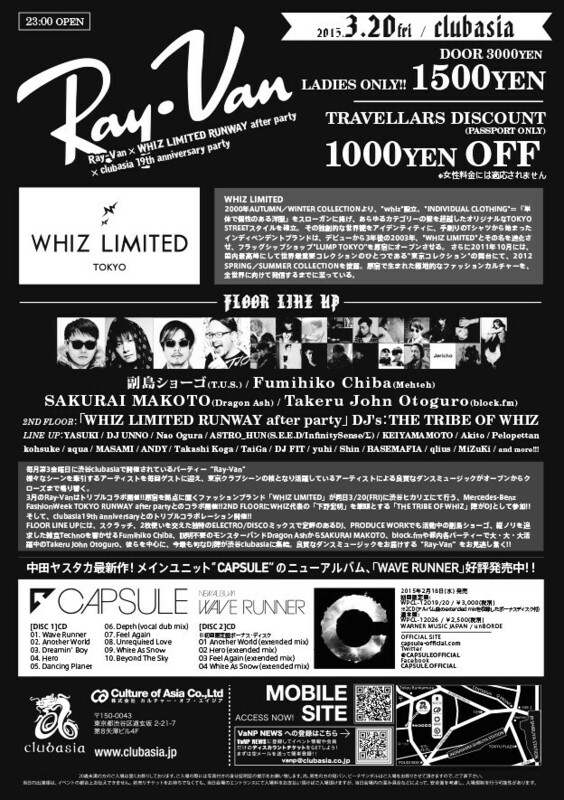 2ND FLOORにWHIZ代表の「下野宏明」を筆頭とする「THE TRIBE OF WHIZ」陣がDJとして参加!! FLOOR LINE UPには、スクラッチ、2枚使いを交えた独特のELECTRO/DISCOミックスで定評のあるDJ、PRODUCE WORKでも活動中の副島ショーゴ、縦ノリを追求した雑食Technoを響かせるFumihiko Chiba、説明不要のモンスターバンドDragon AshからSAKURAI MAKOTO、block.fmや都内各パーティーで大・大・大活躍中のTakeru John Otoguro、彼らを中心に、今最も旬なDJ陣が渋谷clubasiaに集結。良質なダンスミュージックをお届けする“Ray-Van” お見逃し無く!! I cross view of the world and dance music of the text with the width to LOVE SONG - LIFE SONG at the same time to be Singer and make it. I produce all Track production or a design by oneself from every many aspects. Even produce or collaboration such as woman singer are active. On the other hand, I stand, and Electro DJ includes an event and participates in the other event!